I have been staying for the last few days in Hay-on-Wye, meeting two good friends who live in Clyro, where cleric Francis Kilvert also lived and worked for several years in the nineteenth century. On Monday and Tuesday it rained all day, as it often does in Wales, but on Thursday we were blessed with wonderful sunshine for our trip into the Black Mountains, to see an Augustinian priory at Llanthony. The narrow road from Hay-on-Wye winds up and down through moorlands of windswept bracken, wild flowers in abundance, and only ponies and sheep to be seen. This was, apparently, one of Dorothy and William Wordsworth's favourite walks, likewise Francis Kilvert's and, more recently, Bruce Chatwin as a teenager walked here and felt it was "one of the emotional centres of his life". 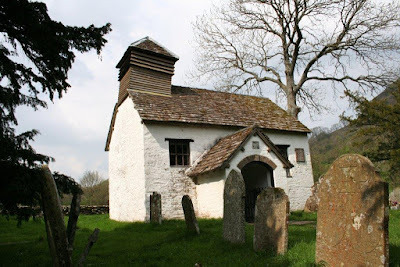 We stopped on the way back from the priory to visit St. Mary's Chapel at Capel-y-ffin, which as you can see is totally delightful, with a lop-sided belfry. It was built in 1762, is surrounded by ancient yew trees, and has two small headstones carved by Eric Gill. The inside of the chapel is very small and the front pew is completely occupied by a range of teddy bears of different sizes. I don't know why they were there, but they seemed quite happy. warm from the summer sun. corals, blues, pinks, and red. By night she knitted pumpkins. What a wonderfully original image of the knitting of feelings into something real. I think a lot of women will relate to this. Thank you, and I hope you had a wonderful break!